I’m proud that I’m a nerd, but I’m not just that – because people are never as simple as what we label them to be, and there’s no point in trying to force it. One of the most common things I hear after I tell people that I went to a science high school is "Wow, that must mean you're smart." Something that is implicitly said is "Wow, that must mean you're a nerd." I won't lie – there is definitely some truth to that statement; however, just because someone's from a science high school doesn't automatically mean that that person is a nerd. For the most part, we're regular high schoolers. Nonetheless, I’ll admit there are definitely some differences. Hopefully, I can show just how different or how similar we are, while clarifying some common misconceptions. 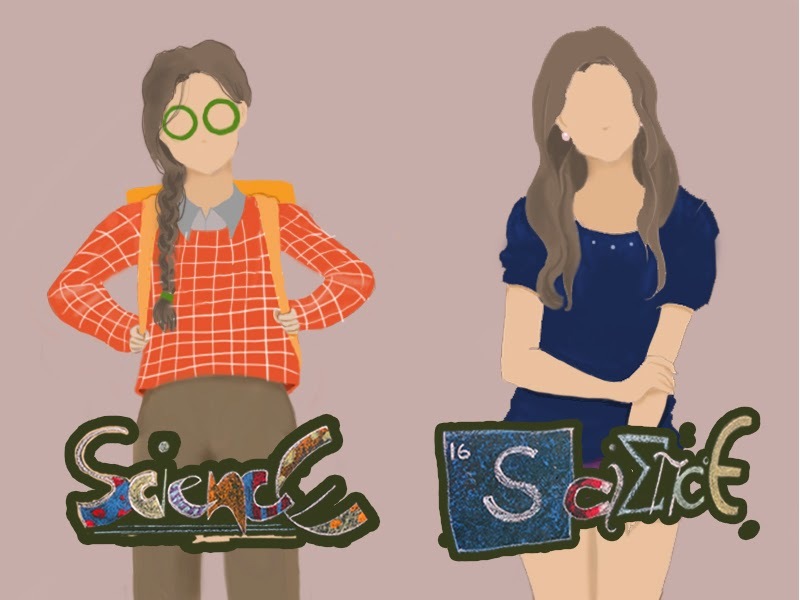 Some people think that if you study in a science high school, you have no problems with math, the science subjects are a piece of cake, and the humanities subjects are easier than the science subjects. On top of that, it’s also assumed that you always have your homework finished long before the deadline, and that your test results are at least decent. Let me be the one to tell you that those things apply to a very, very small minority, if anyone at all. Like any regular high schooler, we struggle, we cram, and we complain about school. It’s not uncommon for people to do their homework (that was given three days before the deadline) the day it’s supposed to be turned in. If they can cram it the period before it’s due, that’s probably when they’re gonna do it. Even in a science high school, there are people that are considered “the nerds." However, along with the nerds, you have the jocks, the cool kids, the band geeks (of both the classical and rock variations), the overacheivers, etc.— pretty much, the (stereo)typical high school setting. Of course, there are also those people who fit into more than one category, like the band geek who’s the best in the batch at Computer Science, or the nerd who likes to toss around a frisbee just as much as the varsity players do. We also have our fair share of good looking people, which I never thought I had to defend before. It was only until I found out that someone was surprised about some of my batch mates appearing on a certain twitter account (hint: it’s synonymous to poultry seen) that I realized the nerd stereotype was being reinforced on us, even in terms of looks. Now we head on to the differences, the biggest of which is the curriculum. When I talk about the curriculum in this part, I’m going to be talking about the pre K-12 one. The DepEd curriculum followed by most schools had one subject each for Science, Math, Filipino, English and Social Science in its core curriculum per year, with a few adjustments and minor subjects added. In my school, we mostly followed the same curriculum for the humanities subjects. The only notable difference was that we studied Noli Me Tangere in first year, and El Filibusterismo in second. Those are only the what ifs of some of my batchmates – and I’m sure others before and after us have had similar ones. One article alone won’t be enough to explain exactly how similar or different science high schoolers might be from those who went to different schools, and how they might feel about that. They have different pressures, while still sharing the essential ones with everyone else – and trust me, that’s enough to warrant its own set of frustrations, too. But no matter what misgivings or frustrations or what ifs I have about entering my high school, I know that I won’t ever regret choosing it, even with the stereotype. I’m proud that I’m a nerd, but I’m not just that – because people are never as simple as what we label them to be, and there’s no point in trying to force it. Rio is (trying to be) an engineer-in-training, an athlete and a singer, with her love for science, sports, and music in that order. She's also (trying to be) a writer, with her trusty laptop/phone, sour cream flavored chips and/or strawberry ice cream. (Whether or not she succeeds is another story altogether). Yanna is an aspiring wizard who enjoys doodling, longboarding, reading and writing. She is also a huge fan of anything Studio Ghibli, although she has yet to watch much of Hayao Miyazaki's films because most of her dvds are pirated. Although she is initially quiet and maybe even serious, those who get to know her will see just how optimistic and weird she really is. What science high school did you graduate from, Rio? But then, there are still considerable differences even inside the science high school system. I agree with the similarities that you gave, but is that really all you were able to see.? There are more things to expound on. Like the fact that we also like to celebrate during the weekends, probably how much we hate Mondays, etc. The differences, well. I totally agree with the first one, with the curriculum. I graduated from Makati Science and I had two Sciences, two Maths, and three Humanities every year. Plus, I had to write theses (experimental research papers) for three years. I felt like I was already in college. My schoolmates and I were able to choose our vocation; we weren't limited to taking Science courses, so that's one thing. But again, these are not the only things that are different. While this article was insightful in its own way, feel that it is quite lacking. Based on your article, I got the conclusion that you're from Pisay. However, I don't think all science high schools have the same curriculum and rules on college course as yours. Yes, you've come to the right conclusion :)) Though the college courses section was more of an error in phrasing, than anything. After writing the first draft of this, I asked some people from other science high schools if they had any rule regarding their college. That's when I found out it was just a Pisay thing. So I admit to that error; also, I suppose that my rephrasing got lost somewhere in translation/editing (and sounded a bit awkward). Parscian here, batch 2007! :) Most of your article also reflects our situation, but I guess the differences we have are: 1) our Noli and El Fili were discussed during our third and fourth year, respectively; and 2) I believe we weren't forced to take up any science-related course for our college degree. came from angeles city science high. member of pioneer class of '97. had 2 different science & math subjects each year (e.g. advanced chem, adv. physics, etc). never had any problems come college (except for damn algebra! -- sorry for the curse). noli and el fili were on junior, senior year. had florante at laura at 2nd yr, i think? most of my best friends came from high school. we still meet, every now & then. FB. WeChat. then went on for med school. heck, some of my former students @ med school were graduates of my former high school. tuition fee back then? 300 pesos for the whole year. My experience was getting really low self esteem because of being around so many smart ppl!! You thought you were smart when you were in elementary. But Science HS completely blew that out of the water. A good follow up article would be to write about where science high graduates end up after college. Going to a science high school with tuition fees paid by the country should go beyond taking a science course in college; the whole point of developing and supporting people who are more inclined to science and math are so that they could contribute to nation-building. I came from a UP high school and by the time I got to college and med school, the science high graduates weren't really much different from my schoolmates and I (especially academically), except that we are more socially-aware with aspirations more aligned with nation-building compared with our science high counterparts, especially those from the main campus. Well, this is true. I am not that perfect student myself. I also have my college and future "What ifs"
Playing it safe can lead to stagnation. And while staying put in your own little bubble may be fine and dandy, it's only when you go out in search of bigger things that you get to truly grow. We're talking action with our new theme, MOVING FORWARD. Send us your essays, poems, artwork, photos, videos, and music! Pitch it and send it to thethingonline@gmail.com! See here for guidelines before you submit. P.S. We are also looking for passionate people to join our team! Click here for more details. A shout-out to all the female homies of Una's music library. The Thing is an online magazine for young Filipinas that explores and embraces all kinds of interests.It stands for individuality, diversity, open expression, and acceptance -- aiming to create an environment where interests can be broadened and enriched, where perspectives can be shared and learned from, and where all interests are given the same kind of importance.